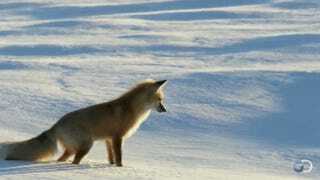 Do foxes use a "magnetic sense" to hunt in the winter snow? Finding food can be especially tough in winter, when the snow is deep and the prey is hidden. So foxes have developed a special technique: they dive headfirst through three feet of snow to find their unseen prey. Amazingly, this works — but only when the fox is facing northeast or southwest. Robert Krulwich at NPR looks at the curious case of the hunting red-fox and it's almost compass-like sense of direction, which was noticed when Czech scientist Jaroslav Cerveny observed the foxes hunting in the winter and started looking at just what makes a successful hunt. When they weren't facing their preferred direction, the foxes were seldom successful. In fact, the preference for jumping NE/SW was there even beyond the winter season. Cerveny believes that foxes have "a magnetic sense." Not only can they see, hear, touch, taste and smell like we do, they've got an extra gift. They can sense the Earth's magnetic field. There are birds, sharks, turtles and ants that can do the same thing. But the fox is the first animal we know of to use this sense to hunt. Gif made from this Discovery Channel clip.